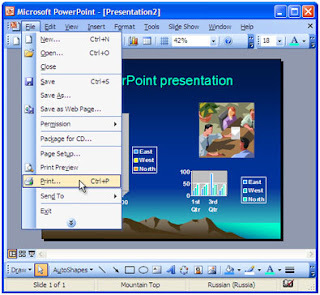 If you want to create printable pages that have notes or descriptive text associated with each slide, PowerPoint has a feature designed to do just this called Notes Pages, or Speaker's Notes (depending on which version you're using). To view the Notes page for any slide, go to the View menu and select Notes Pages. You will see an image of your slide there, and a placeholder for adding your script, notes, or any other text you wish. You can cut-and-paste text from Word here if you like. To print these pages, bring up the Print dialog, and at the bottom of the dialog where it says "Print What:", select Notes Pages. These pages were originally designed to be used as audience hand outs (with space for the audience to take notes) but were also used by many as speaker's notes: the text block would have the script of the presentation, to be used by the speaker, or for sales binders to educated sales people.